Rutgers has hundreds of millions in unrestricted reserves that could go to make tuition affordable, pay raises and make the university a better place for everyone. 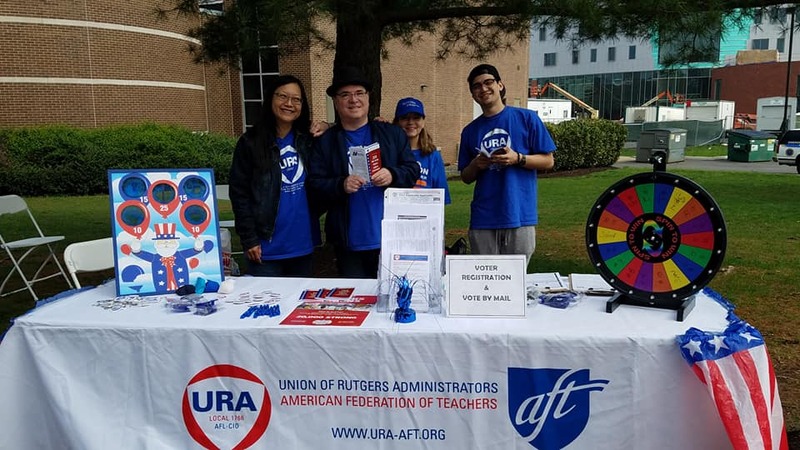 Join URA‐AFT and the Coalition of Rutgers Unions in calling for fairness at Rutgers. 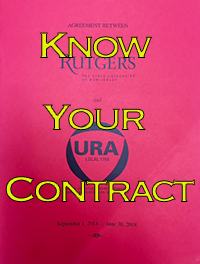 Watch URA members and others at Rutgers speak on the importance of Bargaining for a Fair Contract at https://youtu.be/bM4UbmqedfQ. 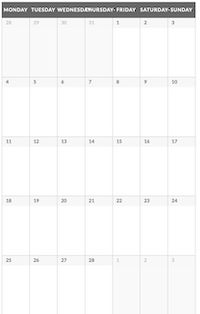 Open to full dues members only. Membership forms available at the door. Last week the New Jersey Appellate Court ruled that the pharmacy benefit management (PBM) contract for the New Jersey State Health Benefit Plan will have to be rebid. OptumRX is the current plan manager and will continue to administer the health plan while the state decides whether to appeal the Appellate Court decision. In the meantime please be aware of your right to appeal any denials from OptumRX. 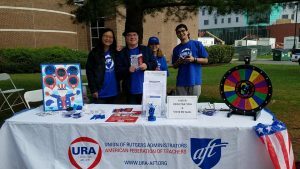 Thanks to all the URA members who made Rutgers Day a record‐shattering success. And a special shout‐out to the volunteers who not only registered voters at our COPE table, but also kept the crowd engaged while providing civic education. Pictures of the URA activities can be found on our Facebook page at https://www.facebook.com/ura1766. Staff Senate Elections 2018 — Cast Your Vote Today! On March 28th Senior Vice President for Human Resources Vivian Fernandez informed the University community that voting has begun for selecting staff representatives for University Senate. The successful candidates will be charged with serving as an important advisory and legislative body to the entire community of staff, faculty, students, administrators and alumni to Rutgers’ President and boards. The URA has identified some of our members (and building representatives and stewards) who are running and looking for your vote and support. You may now vote at the Staff Senate Elections website at https://hrservices.rutgers.edu/vote. Make sure to get your vote in by 4:30 p.m. on Wednesday, April 4, 2018.
http://senate.rutgers.edu/StaffSenatorElectionResults2018.html on Tuesday, April 10, 2018.